4 Bedroom Home on Mt. CB with Amazing Views & Hot Tub!! Winterset is a luxury home located in Mt. Crested Butte. With 4 bedrooms and 4 baths, this home is the perfect getaway for your family or friends. Winterset has all the amenities you could ever dream of! 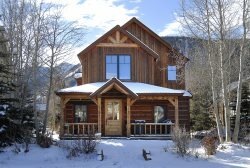 The convenient, quiet location offers 360 degree views of the mountains, biking and hiking trails are moments away, and first class skiing is just a short walk or drive from the house. It can't get much better than this! Winterset is an entertainer's dream! A fully equipped gourmet kitchen with granite countertops and top of the line appliances opens to a beautiful dining area and a comfortable living area complete with vaulted ceilings, a natural stone (wood burning) fireplace, flat screen TV, DVD player, and surround sound. The master bedroom is on the main floor and features a king bed, huge walk-in closet, and a large bathroom. Three other bedrooms can be found in the home as well! The first guest bedroom is located on the main floor and has a king bed. The two additional guest bedrooms are on the second floor; one with a king bed and it's own bath, and the other with a plush queen bed and it's own bath. A second living room is also found on the second floor. With a large couch, comfortable chairs, and a flat screen TV, this space is perfect for the kids or adults looking to relax away from the main living area. In addition, Winterset is equipped with a heated garage for storing all of your summer and winter gear, an office nook for those of you that have to work on vacation, and a laundry room with a full sized washer/dryer. If that's not enough, the home also features a large hot tub surrounded by amazing views of the mountains. Nothing beats a nice soak in the hot tub after a long day of skiing or hiking! The home boasts three decks to enjoy the views from as well. This luxury mountain property has it all - a quiet, convenient location, high end amenities, lots of privacy, and unobstructed views! Helpful, friendly, and quick to respond. The Winterset house is absolutely beautiful and the views are breathtaking! Everything about our stay went above and beyond our expectations! The Staff at Alpine was friendly, extremely helpful ( we had our 9 month old Grandson & needed supplies for him) They told us about how to reserve a crib, high chair, ski rentals, lift tickets, & grocery delivery. Felt very comfortable booking this trip with them. 21 Winterset was outstanding, we all had our own bedroom/ bath & overall private space. We all were very comfortable. The home has everything you will need for a vacation stay! Truly a warm & welcoming home! Top notch, from inquiry to checkout. Clean, fresh, amazing tasteful dcor and furnishing, kitchen had everything we needed, and I mean everything!!! Quiet location and beautiful views. Very well stocked kitchen, clean & nicely decorated. Nice book and DVD libraries. We loved this property?! Very comfortable for 4 couples! Perfect location and excellent views! did not see anyone except the lady who takes care of flowers. We loved it and are considering returning next year. There was an issue with the hot water and as soon as I let the owner know, the management handled it immediately and apologized for the inconvenience (which was minor). Thanks so much for sharing your family's beautiful and warm home with my family and me! The home is BEAUTIFUL and well maintained and in the perfect location. We loved being there and I cannot imagine celebrating my 50th anywhere else! The team was attentive, accommodating and readily available. This was the best property we have stayed in, in CB. Christina was super sweet and easy to contact. MANAGER RESPONSE: Thank you Kristen! I'm happy I was able to help you plan your stay. We loved the Winterset property. It was clean and spacious and worked great for our family. The views were spectacular and the house was so comfortable. We had a wonderful time! We are already trying to find a time repeat this vacation! My favorite feature of the property was the location and quality/style of the interior finishes.